Gurihiru-Blog: Illustration Friday "warning "
how is it drawing with the ipad? are you using your fingers or a stylus? Love the black and white, OK,grey tones as well. A bat invasion? How cool! Cool illustration. Katrin- yes. 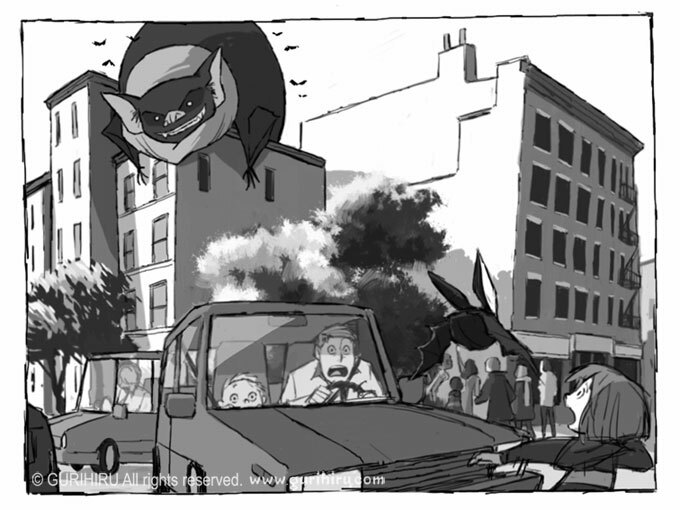 Giant bat appeared suddenly. i use the PIP, too, guri! i really dig it for short burst doodles! this is great, man! love the wild and active composition! Fantastic detail! I use the iPad too, and have been meaning to get a better stylus, so thanks for your recommendation! Great work! WOW! this is amazing! love your style! My oh my!!!! I love coming to your blog. I always leave inspired!! !